I’m going to go ahead and warn you now that this is going to be a long post I just don’t see the point in only reviewing one manga at a time if I have read a lot in the same series. But, let me know if you don’t like it this way. 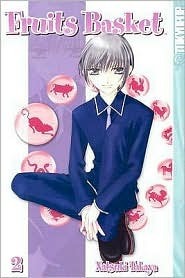 Let me start my Fruits Basket review by saying that this is my first traditional manga read. Meaning that it reads from right to left. It took me a little while to get the hang of it but not so long that it took away from the story. Fruits Basket was very different from anything I have read recently. I say this because 1) I have never read about characters that are cursed in the way that the Sohmas are cursed. And 2) I have never read a character as optimistic as Tohru Honda. In all honesty she should have gotten on my nerves, but somehow the storyline and her character all balanced out for me. I liked the Sohma family members that I got to meet in volume 1. It was fun to see how they are like their Zodiac animal they turn into. They are like any other dysfunctional cursed family you know. After Tohru goes to live with the Sohma’s it is very obvious that there is going to be some chemistry between Tohru and Yuki and also between Torhru and Kyo, they are all teenagers, I like how this didn’t get weird or angsty. I know this is marketed as a comedy and even though it is funny I thought it dealt with death and family issues well. 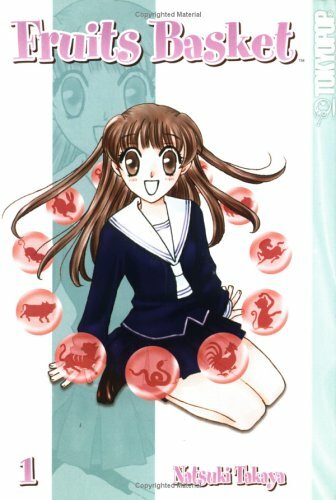 My intro into Fruits Basket was super fun! I think I smiled from start to finish. This volume starts out with Tohru’s two best friends coming over for a visit. I love that her friends are real friends that care for her well being, they want to make sure that she is being taken care of in the Sohma house. Which could be bad for the Sohmas as one of her friends is a bit psychic and they have that curse to keep secret. At school they are all getting ready for a festival and that is were we get to meet two new Sohma’s who are also members of the Zodiac. Momiji, who has got to be the cutest little guy ever! How can you not love someone who turns into a bunny when you hug them…so cute. 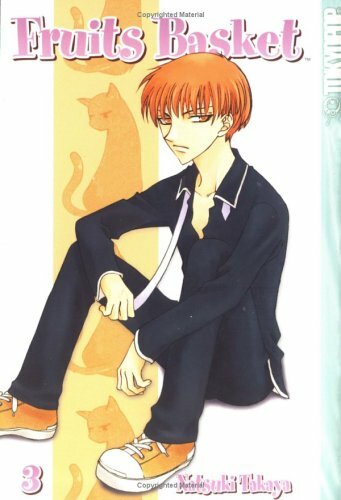 The other new Sohma is Hatori who scared me more than a little bit at the beginning, but by the end of volume 2 I just wanted to give him a big hug because of all he had been through. I really liked that we got to see what a big deal new years is in Japanese culture in this volume. I loved how Yuki and Kyo came to Tohru’s rescue so that she would not have to be alone. It was nice to see their friendship grow. I have not said this about the previous volumes but I love the notes that the author, Natsuki Takaya has distributed through out Fruits Basket. They are so much fun to read! They always retain to the story or something a fan has asked about. Ok, so one of my new favorite characters in this series is a total cow! No really, he turns into the cow of the Zodiac. Haru has a split personality. There is black Haru who wants to get into trouble and fight with Kyo all the time and there is white Haru who is perfectly polite and nice. Haru is just fun because you don’t know what you are going to get. Through this volume I could see walls that have been up between Kyo and Yuki slowly being melted by Tohru’s influence over them. Though I don’t know that they will ever really be friends, it was nice to find out more reasons of why there was so much animosity there. I’m glad they have her. This series is so fun! Anyone who is wanting a manga starter needs to look no further. Anyway! You know, I have trouble with the other kind of manga... of comics, actually. If you give me a manga or manga like book that reads from left to right, I'll probably botcher the whole reading thing. Then again, I've been known to open books from the end, thinking they were written right-to-left, so... Yeah. I haven't read the manga but I did watch the anime and I thought it was cute. I liked the whole Chinese Zodiac sign issue. Great reviews! I think this manga series is a classic. I've seen it everywhere but haven't picked it up. I don't know what my issue is but I like the tidbits of the Japanese culture and the zodiac signs have me really curious. I'll have to check into this series for sure! Yay Fruits Basket! I love it. It was my first manga too. It was hard to get used to, mostly because I was new to the style. I love Takaya's notes too. I've learned that pretty much all mangakas do it. Same as you, I really liked Toru although the nonstop optimism would normally drive me crazy. Does anyone know where I can buy this manga I really enjoyed the anime I want to read them now.